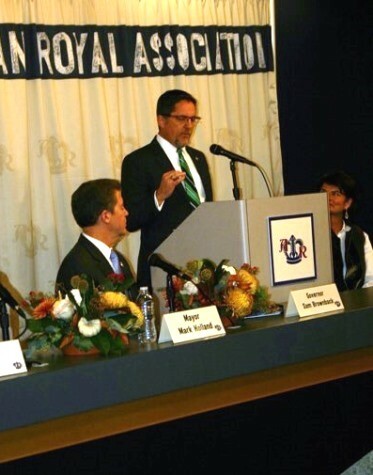 American Royal proposes to move to Wyandotte County – Welcome to Wyandotte Daily! About 150 public officials and private sector business leaders crowded into the Media Center at the Kansas Speedway Tuesday afternoon, Oct. 25, to learn that the American Royal Association plans to build a $160 million event center and related buildings in western Wyandotte County. The proposed area for development includes 274 acres just west of the Legends on property now owned by members of the Perry family and the Sac and Fox and Kickapoo Indian tribes. Kansas Gov. Sam Brownback said the sales tax bonds will finance about half of the project. The rest will be raised by private-sector giving. The area for the proposed sales tax bonds, which will help pay for infrastructure, would be about 530 acres and include The Plaza at the Speedway. These sales tax bonds are what were used to develop the Kansas Speedway and the Legends Outlets. Gov. Brownback made it clear that without these sales tax bonds, there would be no development. Gov. Brownback said this new location will encourage growth and expansion of Kansas agriculture beyond its borders. He said it will be a worldwide epicenter that will encourage great progress in such fields as animal genetics. Cliff Illig, a member of the American Royal Board of Directors, said the new complex will have an event center with some 300,000 square feet of floor space. Illig is a principal owner of the Sporting Kansas City soccer club that plays its home games in the Legends. Plans also call for at least two smaller arenas, Illig said. Illig was one of the founding partners of Cerner. The board of directors of the National Agricultural Center and Hall of Fame in nearby Bonner Springs announced its support for this effort by the American Royal. Mariner Kemper, whose banking family has been longtime supporters of the American Royal, praised the plans for the proposed new location. He said this will help the American Royal become the “Kentucky Derby” of livestock and horse shows. Kansas City, Kan., Mayor Mark Holland said this project marks several years of work by the state of Kansas and the Unified Government of Wyandotte County. “The new vision of the Royal that has emerged is a hub and showcase for agriculture and animal science,” Mayor Holland said. The mayor said the American Royal will offer event space for year-round use. It is expected to attract private-sector-development such as restaurants, hotels and retail stores. The American Royal also offers a professional rodeo and the World Series of Barbecue. The American Royal can trace its roots to 1899. The nonprofit organization presently has buildings in the bottoms of Kansas City, Mo., close to where the Kansas City Stockyards were. 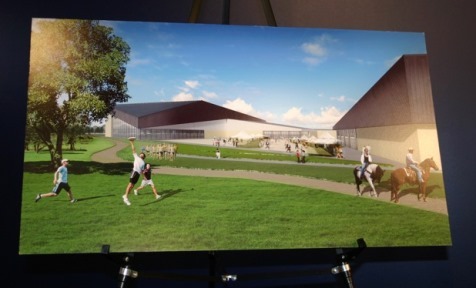 An artist’s rendition of the proposed American Royal development in western Wyandotte County. 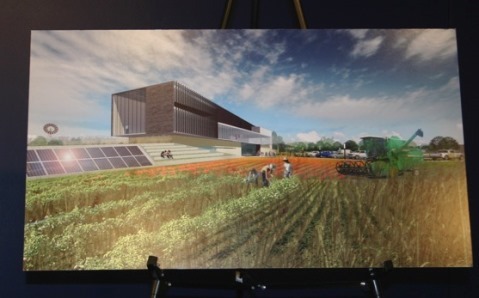 The artist’s rendition was on display at the announcement today at the Media Center of the Kansas Speedway. 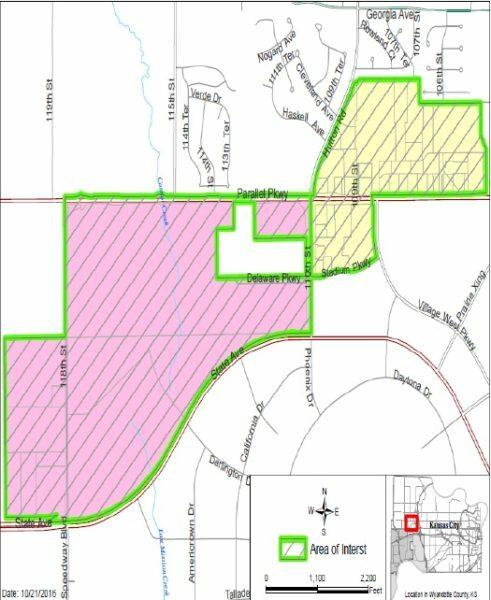 A map of the proposed STAR bond district for the American Royal can be found in the Unified Government’s agenda for Oct. 27, online at www.wycokck.org. On Thursday, the UG Commission will consider a resolution for a public hearing Dec. 15 to consider creating a new STAR bond district. Congrats to everyone involved on bringing the Royal to KCK. However, I wonder if these announcements would be seen in a slightly different light if “STAR bonds” were instead called “We are using your money to build this thing bonds”?